How are you? I'm not sure if you have seen or heard about What To Wear Tonight, a new online shop that launched just before Christmas, yet. Unfortunately, the shop closed down in 2015 but instead of deleting my review, I've decided to keep this post and show you what pieces they've sent me to review. I found out about WTWT on Twitter and they've asked me if I'd like to review their clothing range and the shopping experience on their website. 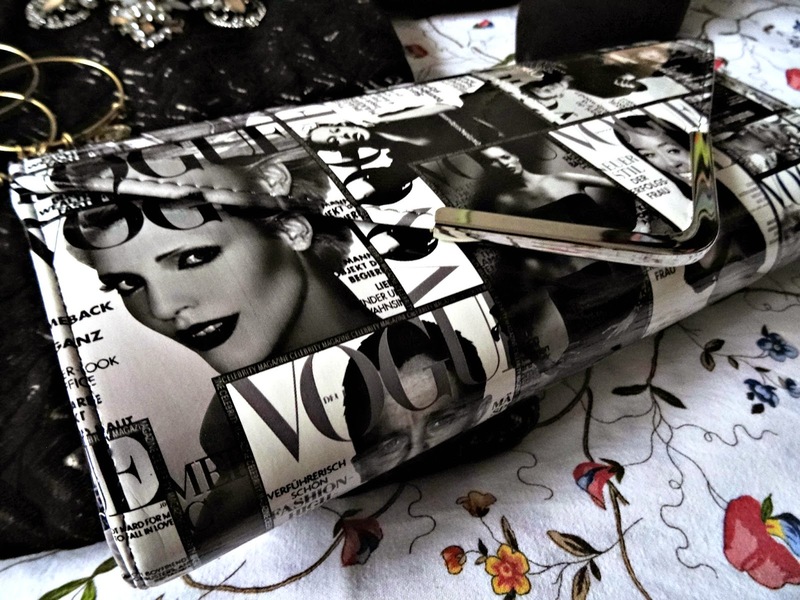 Shopping is always a good idea, so before Christmas, I browsed through the collection of beautiful dresses, knitwear, coats and accessories and found an incredible magazine clutch with Vogue covers. These and cover bags were a must-have last spring and are still on trend. It was certainly time to get one myself! Part of my budget was planned on a dress, but it took me a long time to make a decision, as they were all gorgeous! A sparkly blue tube dress caught my eye straight away and I imagined myself wearing it and look like the perfect ice princess. In the end, I decided against it because I spotted a chic and elegant brown dress, which was more my style. It works very well as a going out dress with heels, the clutch and statement accessories, but I can also wear it as a sophisticated city dress with flats and a bucket handbag. The ordering process was quick, easy and hassle free. WTWT worked like all online shops. First, you would set up a free account, select your choices and place your items into a cart. At the checkout, you had the option to pay via PayPal, American Express, Maestro or Visa debit card. All orders in the UK came with free delivery. After I placed my order, I got very excited and tweeted to WTWT. They answered promptly and said I was their very first customer. Wow! It took then two days for the package to arrive. Both items were wrapped and sealed securely in separate plastic bags and came in a big sized carrier envelope. Alongside the receipt came an additional green bracelet as a Thank You, which I found very nice and a thoughtful gesture. I teamed up the dress and clutch with my Jane Norman high heels, the Cali necklace from Juste Bijoux and my stunning bracelets from Karma Jewellery. My What To Wear Tonight OOTD post is here. The clutch is exactly how I imagined it would be. It has Vogue covers printed all over, a decent size with lots of space. The cool design is so stylish, especially the V-shaped flap with the metal edging and the magnetic clasp. 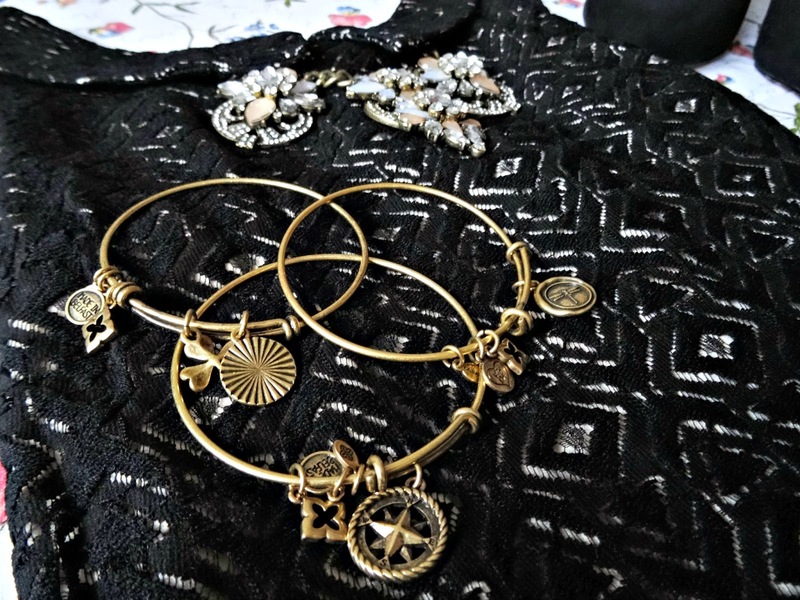 It is very light and has a chain so you can easily wear it around your shoulder. 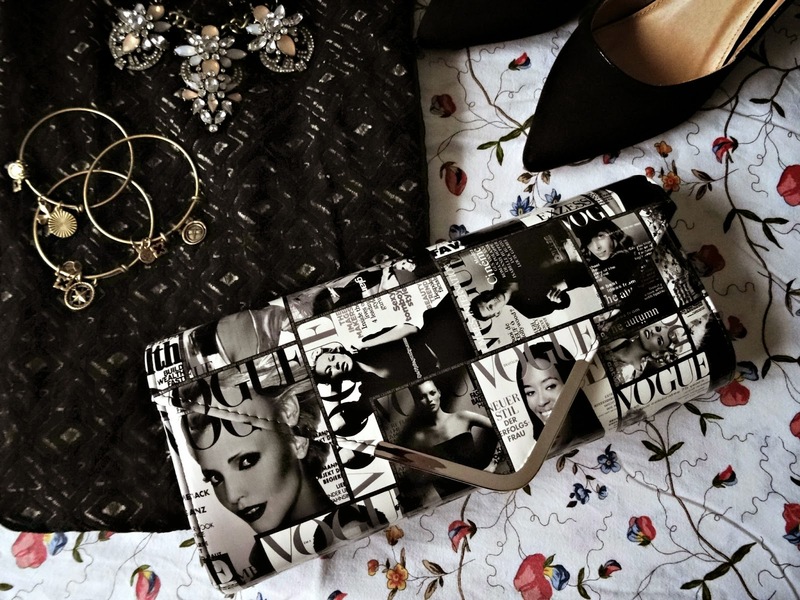 This stunning clutch bag comes in black/white or in bronze/silver. Now, the sleeveless dress comes with a retro Pan collar on the front and low round back. It has an inner dress which is beige and shines through the lacy black outer dress to create a sophisticated effect. It has a great fit and feels soft and of good quality. I absolutely adore the elegance of the dress, which might be for some too basic, but it'll look great to any occasion. Whether it is the shopping tour, or for a night out, or as a classy look for the office, this dress is so versatile. Very pleased with my choices. Thank you so much for reading today's post. Have you heard of What To Wear tonight before? How would you style the dress or the clutch?